-10 % discount until 01 Nov 2018 (not valid for period 23 Dec 2017 - 03 Jan 2018). - 7=6 and 14=11 nights for the period 16 Dec - 27 Dec 2018 & 04 Jan - 12 April 2019. Extras are combinable with early booking discount. 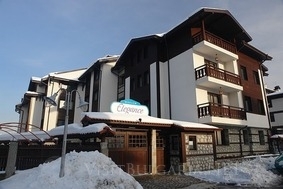 Location: Elegance is a cozy apartment complex a part of Winslow chain located in the biggest and most desirable ski resort in Bulgaria, Bansko. The distance to the cabin lift in Bansko is less than 600 m and around 800 m stand between this apartment hotel and the center of Bulgaria's biggest ski resort. Elegance was built in 2007. The complex disposes of a beautiful hotel garden, outdoor parking lot and it offers a regular shuttle bus to the ski slopes and the center of the resort town of Bansko. Accommodation: Elegance apart-hotel disposes of studios, 1-bedroom and 2-bedroom apartments. Each one of them is nicely furnished and disposes of everything necessary for your pleasant and comfortable stay, such as: TV/cable TV, fridge, cooking facilities, disposing of the necessary utensils for preparation of food, etc. Spa & wellness: The Spa and Sports Center of Winslow Elegance offers: fitness hall, sauna, Jacuzzi, steam bath and massage room. Each guest will also be granted the opportunity to relax in a tranquil atmosphere at the lobby bar after a long day skiing. The proximity to the cabin lift in Bansko is turning Elegance into even more desirable place for your ski vacation in Bulgaria's premier ski resort.